The “Buckeye” state of Ohio is situated in America’s Midwest region, although it is one of the northernmost states in that area. While its total area is only larger than 16 of the 50 U.S. states, ranking 34th in that category, it is currently the 7th most populous state and one of the most densely populated states in America. It is also an ideal place for mountain biking enthusiasts—a state that hosts a wide variety of unique courses for every level of rider. In terms of its terrain, a large portion of Ohio is dominated by glacial plains. The most obvious exception to this is the “Great Black Swamp,” an area in northwest Ohio known for its marshes and reedy flora. Another exception to Ohio’s low-relief and rolling glacial plains is the Allegheny Plateau, which features rugged hills and wooded forests that are simply perfect for scenic treks on a mountain bike. In the following piece we will further discuss the mountain biking scene in the great state of Ohio, and introduce you to five of the region’s most well-liked trails—courses that are designed for beginners, intermediate and advanced riders alike. Located in the large city of Cleveland, Ohio, Ray’s Indoor Mountain Biking Park is the world’s first multi-terrain indoor bike park an absolute blast to ride. The park is named after its founder, Ray Petro, who opened the park in the latter half of 2004. He undertook this project because of his frustration in the inability to ride during the cold winters in Ohio. He invested his life savings of $50,000 and also used a $25,000 loan to fund the startup costs. Since its opening, Ray’s Bike Park has been a haven for riders of all ages and ability levels, and the park is only open during the winter months (when outdoor riding is impossible). Using some very creative carpentry skills, Ray and his army of volunteers transformed 140,000 square feet of warehouse space into several rooms of mountain biking trails—trails that simulate the experience of traversing along mountain peaks, down ravines, around wicked curves and over tree roots. Slabs of wood simulate logs to jump, or narrow railroad ties to ride across. There is even a pump track at Ray’s, where riders learn to use their momentum to ride up and down hills, rather than pedaling their way through. 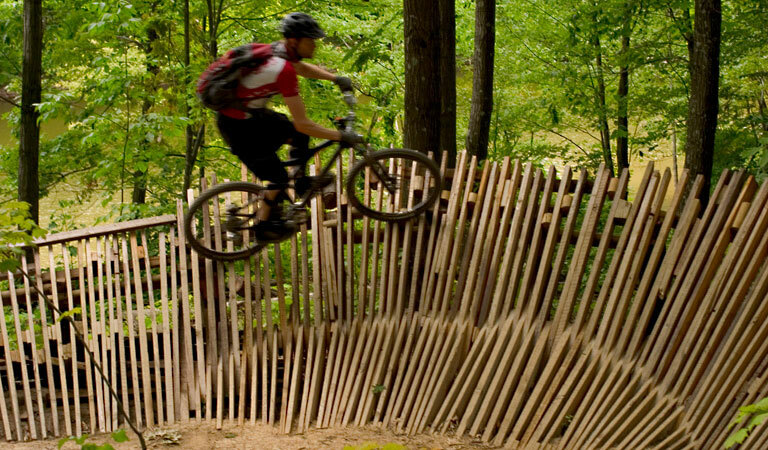 Ray’s Indoor Mountain Biking Park has continued to gain in popularity each year, and its founder recently recreated his park in Wisconsin as well. Situated in the town of Wooster, Ohio, Vulture’s Knob is the state’s oldest privately-owned course that is also open to the public. The 10-mile, advanced-rated trail system consists of 125 acres of terrain on a course that stretches along the beautiful and mighty Killbuck River. The facilities here are open 365 days a year for open riding and the park is funded through donations and volunteer memberships. The Vultures Knob trail system is located approximately 30 miles southwest of Akron, 50 miles south of Cleveland and 90 miles north of Columbus in Ohio. The Kris-Mar Trails, located in the town of Marietta, Ohio, feature some 12 miles of beginner-rated (green dot) terrain. Its primary loop travels through the very majestic Kris-Mar Woods and rolls fairly gently around the valley with just a few technical sections. Riders here can add miles to the course by stacking loops with some of the surrounding trails. The well-marked Kris-Mar Trails represent the perfect getaway for novice riders and family groups, as they afford a great opportunity for leisurely riding without some of the obstacles and risks typically associated with more advanced tracks. The main course here features some very wide and winding terrain that is made up mostly of hard-packed dirt. There are a few minor obstacles that cyclists much watch out for, including roots, rocks and some of the other ingredients typically found on intermediate-level courses. Perhaps the best part of the Kris-Mar Trail system is the awesome scenery riders are treated to as they make their way through the Kris-Mar Woods. Located in the town of Loudonville, Ohio, the Mohican State Park Mountain Bike Trail is the state’s longest single track course at approximately 25.5 miles in total length. The course is rated intermediate in terms of difficulty, and includes a number of the great characteristics that mountain bikers collectively embrace. Simply put, when it comes to the Ohio mountain biking scene there is perhaps no trail as beloved as the one at Mohican State Park. The course offers the perfect recipe of difficulty, thrills and challenge, boasting several great climbs, rapid descents, and an obstacle-laden and very fast single track that definitely has to be ridden to fully appreciate. From the opening trailhead, riders begin a gradual climb that will get their legs burning, but they are soon rewarded by a breathtaking descent that forces them to be wary as they negotiate the hill’s many twists and turns. At the peak, riders are treated to great views of the park, making it the most logical place to stop and recharge before tackling the remainder of the course. The flatter portions of the Mohican Trail present riders with some tricky obstacles, both natural and manmade. Rocks, roots, jumps, bridges and other unique challenges ensure that every cyclist who dares tackle this course gets the most from their efforts and a true testing of their bike-handling skills through a wide range of well-placed hindrances. The first 8 miles of the Mohican Trail are multidirectional, but from that point on it is all one-way (counter-clockwise) traffic. Hikers may also be on the trail so riders are urged to keep their eyes peeled and allow for safe passage. For those so inclined, there are a number of wilderness campsites located throughout the park, all of which are very close to the trail. The Royalview Trail is a 9-mile course located in the small town of Strongsville, Ohio and one of the most favored recreational spots in the entire region. The trail actually consists of two courses—the Red Trail and the Yellow Trail—which differ slightly in terms of their difficulty. Royalview’s Yellow Trail is a course that meanders easily through the park’s young forests and passes by an old foundation and chimney. Riders who opt for this course will enjoy gentle climbs and beautiful views of a nearby creek. The Red Loop, on the other hand, offers some very challenging slopes and ravines with dramatic river views through a quiet pine forest. It also features an optional “out and back” section. Royalview Park is open 7 days a week except during the snowy season. Mountain Biking is not permitted within the park from one-half hour after sunset until one-half hour before sunrise or when the trail is closed for the winter.